Winter is around the corner, which means colder weather is on its way. Staying warm is a top priority, but can you save money while doing it? Aside from snuggling under blankets or drinking hot chocolate, here are a few tips on how to prepare your home for wintry weather while putting more money back into your bank account. 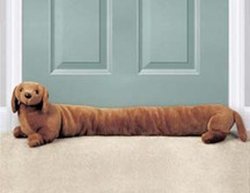 Using a draft snake — or dog — can help you prevent cold air from blowing into your home. According to the U.S. Department of Energy, drafts can waste 5 to 30 percent of your energy use. But how do you prevent the cold air from blowing in your home? Caulk around windows and doors if the gap is bigger than the width of a nickel. Install storm doors and windows. This can increase efficiency by 45 percent. If you purchase energy efficient doors, windows and skylights, you can also qualify for a federal tax credit covering 30 percent of the cost, up to $1,500. Turn down the heat when you leave your house. Every degree you lower the thermostat can save one to three percent on your bill. Purchasing a programmable thermostat will help keep tabs on temperature. They are available for $50, but can save the average family $180 per year. This can cut heating costs by as much as 10 percent. That’s right, your fan doesn’t just keep you cold. Run the fan in a clockwise direction creating an upward draft and pushing hot air down. This should be done once per month during heating season. Buy filters in bulk and store them near the furnace. This will reduce the cost of each filter, and serve as a constant reminder to change your filter each month. LED lights use 75 percent less energy helping you to save on your electric bill. LED holiday lights last 25 times longer. LED lights are safer because they generate less heat. Other quick tips include using your fireplace more, tuning up your heating system, cleaning your gutters and assessing your roof for missing shingles. Also, now is the perfect time to take an extra step and conduct an online energy check-up. This will help you save on both money and energy during the holiday and winter seasons! For more ways to save, check out the in-home energy assessment and AEPOhio.com/WasteLess. Don’t forget to share this information with family and friends!